You can purchase PDFs of many of our books from e23.sjgames.com, DriveThruRPG.com and Paizo.com. The Space 1889 PDFs use Heliograph's scans from the print publications, but return the color pages to the core Space: 1889 book as well as Conklin's Atlas. It also includes Space: 1889 cardboard heroes and 11"x17" color deckplans from Cloudships and Gunboats, as well as the large scale color maps from Sky Galleons of Mars. With the exception of the Sky Galleons/Cloudships and Gunboats combination, the PDFs are offered as separate titles, unlike the double book format used for many of the print editions. PDFs of our Zeppelin Age titles and the Complete Canal Priests Of Mars are standard (non-scanned) PDFs. Our books are available through the traditional book distribution system, so you should be able to special order them through your local bookstore or buy them from an online bookseller. Our books are available from Ingram and Baker & Taylor, the two largest book distributors in the US, and from Blackwell's and Bertrams, the two largest book distributors in the UK. We are not currently in hobby distribution, but you can get our books from Leisure Games in the UK and Noble Knight Games in the US. All of our books are carried by the various Amazons, and the links below are to Amazon.com. 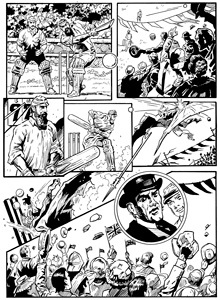 Examine sample pages from The Complete Canal Priests Of Mars! 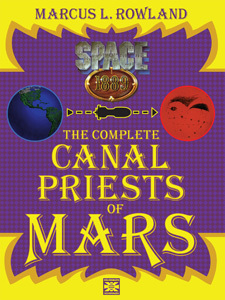 The Complete Canal Priests Of Mars is available now from Drive Thru RPG and e23.sjgames.com, and in print format from Amazon.com. Role-Playing In A More Civilized Time. Everything Jules Verne should have written. Everything H. G. Wells could have written. Everything A. Conan Doyle thought of, but never published � because it was too fantastic. Everything you need for adventures of the century! This rulebook is the heart of the Space:1889 role-playing game. It contains the complete role-playing rules, plus the exciting background of Victorian science fiction: ether flyers and Martian cloudships, the canals and civilizations of the red planet, Venus� swamps and dinosaurs, the honeycombed interior of Luna, and the thrills of inventions and inventors � the driving force behind Victoria�s multiworld empire! It also includes the errata and additional rules from the Space:1889 Referee�s Screen. Beastmen of Mars is a five session adventure, including rules and aids for exciting chase sequences through the streets of a Martian city, details of two very different nations of Steppe Martians, diagrams of a canal ship and a new High Martian screw galley. Canal Priests of Mars is a four session adventure of high adventure and unexpected plot twists. It begins in London, details an ether flyer journey from Earth to Mars, and finishes with a bang on Mars. Note that this is the version of Canal Priests originally published by GDW. The uncut Complete Canal Priests of Mars is also available from Heliograph. This 144 page book contains Cloud Captains of Mars, which details the famous piratical cloud captains and Karkarham - the Casablanca of Mars! Conklin's Atlas of the Worlds and Handy Manual of Useful Information contains detailed information and maps on the solar system of the Space:1889 universe, including Mercury, Venus, Earth, Mars, and Luna. 108 pps. Paperback, 8.25" x 11" - HG1891 - ISBN 1-930658-05-2. $17.95. A Complete Set of 19th Century Aeronaval Miniatures Rules. Set in the Space:1889 universe, this stand-alone book contains aeronaval combat rules, scenarios, details on fleets of the world, ship design, and global scale campaign rules. 120 pps. Paperback, 8.25" x 11" - HG1904 - ISBN 1-930658-04-4. $18.95. This book combines the text portions of Sky Galleons of Mars & Cloudships and Gunboats. Contains the rules, scenarios, campaign rules, deck plans, and ship design rules, and ship designs for the Space:1889 role-playing game. It does NOT include any of the non-text portions of the orginal boxed sets: no plastic ships, dice, counters, maps, cardboard heroes, etc. Nine stand-alone adventures set on Mercury, Venus, Mars, and the orbital heliograph station HMS Harbinger. And excellent set of introductory adventures for Space: 1889. Soldier's Companion By Frank Chadwick. HEL 1984. ISBN: 1-930658-10-9. 8.5 inch by 11 inch format. 192 pps. $24.95. This long awaited reprint combines a good, solid set of of 19th-century miniatures rules with the Victorian Science Fiction elements of Space: 1889 ®. While allowing for the addition of land juggernauts, combat tripods, and aerial flyers, the rules work just was well for a rag-tag British column fighting its way through the passes of the Northwest Frontier. Soldier's Companion covers the wealth of period military equipment and extensively details the major armies of Earth, Mars, Venus, and Luna. 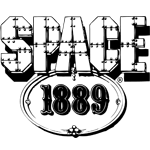 For more detail, see http://www.space1889.com. Caravans of Mars is a sourcebook of the eastern desert and caravans which traverse it, and an adventure dealing with a delicate diplomatic mission to a remote desert city-state. Steppelords of Mars is a sourcebook of the Nepenthes-Thoth Steppe, a region of vital importance to the continued survival of the British colony on Mars. Steppelords also contains an adventure set in the region. Transactions of the Royal Martian Geographical Society, The Journal of Victorian Era Roleplaying, Volume One, is chock full of material for Space: 1889 , and also contains some material for Call of Cthulhu. TRMGS Volume One contains Issues One through Four of TRMGS, with some new art, an index to Space:1889 articles in Challenge magazine, and an index to Space:1889 published products. TRMGS Volume One has it's own page listing the contents and a large number of sample articles. Buy TRMGS Volume One From Amazon.com in the USA! Transactions of the Royal Martian Geographical Society, The Journal of Victorian Era Roleplaying, Volume Two, is chock full of material for Space: 1889 . TRMGS Volume Two contains Issues Five through Eight of TRMGS in an all new layout with new art. TRMGS Volume Two has it's own page listing the contents along with a large number of sample files from the book. Buy TRMGS Volume Two From Amazon.com in the USA! TRMGS 3 contains the articles from the first six months of TRMGS Online. You can actual preview all of the material online on the TRMGS 3 page. TRMGS 3 contains material for Space: 1889 and other Victorian Era games, and includes reprints of some material from Challenge Magazine. Stories From The Zeppelin Age! Edited By Matthew Goodman. Introduction By Will Murray. Cover By Chris Appel. 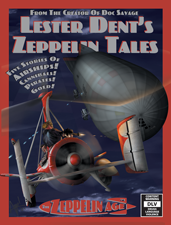 Lester Dent's Zeppelin Tales is nearly 100,000 words of pulpy goodness! It should be available from most online booksellers shortly (it is currently listed with BarnesAndNoble.com and Amazon.co.uk), and you can special order it from your local bookshop: just tell them it is available from Ingram or Baker & Taylor in the US or Blackwell's or Bertram's in the UK. Buy the PDF version from e23! Buy the print version of Lester Dent's Zeppelin Tales from Amazon.com, which usually discounts our books at 34% off! In 1900, The Solar System Was A Very Different Place. Originally published in 1900, this reprint contains the complete texts of the serialization of "Stories of Other Worlds" and the expanded novelization A Honeymoon In Space with all of the artwork from both versions. Travel with Lord Redgrave and his beautiful bride Zaidie as they journey through the heavily populated solar system of the year 1900. This is not a facsimile reprint: the text has been reset into a easy to read typeface, but not one word has been omitted! An Evil Emperor. A Titanic Struggle. Daring Rescues. Flying Ships. Mind Control. A Small Band Of Rebels Led By A Beautiful Woman. When a young inventor cracks the problem of flight in 1903 he becomes the key tool of The Brotherhood Of Freedom, a worldwide rebellion against the cruelties of the Russian Tsar and society at large. The hero soon falls under the spell of Natasha, the Angel of the Revolution, and leads his airships in daring rescues, flights of exploration, and key battles the Armeggedon of 1904. "Our empire is not bounded by the roofs of subterranean caverns, but only by the limits of the planet�s atmosphere. We can soar beyond the clouds and dive beneath the seas. We have realised what he called the Vril force as a sober, scientific fact; and if I thought that you, for instance, were my enemy, I could strike you dead without so much as laying a hand on you. And if a dozen like you tried to overcome me by superior brute force, they would all meet with the same fate." Over a century of peace follows the Armageddon of 1904 detailed in Tsar Wars Episode One: Angel of the Revolution. The fifth generation of the Brotherhood of Freedom enforces the peace with flying ships and the mighty Vril-Force�until he last living child of the Tsar's line, Olga Romanoff, "beautiful beyond description and evil beyond comprehention," strikes back in revenge and plunges the world back into war. Will the arrival of a Death Star throw the world into total chaos? Originally published in 1934 and out of print for decades, Cossack Girl is now available in print from Amazon.com, Barnesandnoble.com, and other online booksellers, in PDF from e23.sjgames.com, DriveThruRPG.com, and Paizo.com, and in eBook format from Barnesandnoble.com. 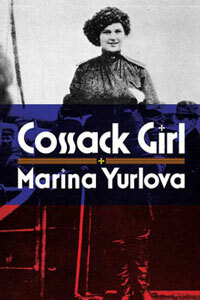 Our free PDF sample includes the first chapter of Cossack Girl. Madagascar: Land of the Man-Eating Tree presents the facts, myths, and legends of Madagascar as viewed by a former governor of Michigan. Learn about cultures and creatures, pirates and castaways, and the interesting scientific and political beliefs of a highly educated and well traveled author of the 1920s. Originally published in 1924, this unabridged edition retains every word of the first printing in reset text, along with all the original maps and photos. 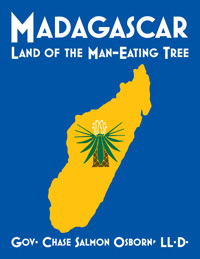 Madagascar: Land of the Man-Eating Tree is now available in PDF from e23.sjgames.com, DriveThruRPG.com, and soon from Paizo.com.